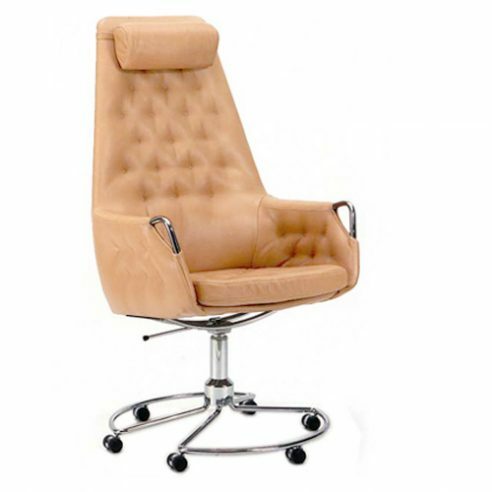 Milton High is a soft upholstered armchair designed for executive use where excellent sitting comfort is required. The combination of upholstery supported by webbing wrapped around a steel frame gives excellent support throughout the working day. The chair is equipped with a unique six wheel circular base giving both stability and freedom of movement. creating new forms of resilient furniture combining lightness with good comfort. Mathsson returned to the theme in the early 1970’s with a collection of high density stacking chairs including the commercially successful conference chair Mia series. In the mid 1970’s a new series appeared including Milton and Mirja designed specifically as conference chairs and in 1980 added Milton and High Milton with a gas lift mechanism contained within the bearing support. The names (all beginning with the letter “M” a trait Mathsson gave to all his chairs designed for Bruno Mathsson International) simply defined the type of base fitted to the same button stitched upholstery.